LONDON--(BUSINESS WIRE)--The pharmaceuticals logistics market in North America is expected to grow at a CAGR of close to 5% during the period 2018-2022, according to a new market research study by Technavio. The report categorizes the pharmaceuticals logistics market in North America by supply chain that includes cold chain and non-cold chain. The report also determines the geographic breakdown of the market in terms of detailed analysis and impact, which includes key geographies such as US, Canada, and Mexico. There was a notable growth in the pharmaceutical market in North America during the period 2005-2015 with the growth rate being around 10%. This growth is expected to continue during the forecast period. The sales of generic drugs in the US were estimated at approximately USD 70 billion in 2016 that was nearly a quarter of the global market. The main reason for the rise in generic drug sales is the expiry of several patents on drugs as well as reforms in the healthcare sector favoring generics. The market is highly fragmented due to the presence of several local and national level players. To gain access to extended networks and proprietary knowledge, many big players are using consolidation as a tool. Consolidation assists big logistics firms in gaining new technologies and expertise from local players and in turn, provides small vendors the financial and infrastructural support that they require. The pharmaceuticals logistics market in North America is highly fragmented with the presence of several large and small players. Secured pharmaceutical supply chain functions and cloud-based supply chain solutions are the areas in which these players are currently competing. Pharmaceutical manufacturers are the only customers in the market. Product diversification is the major aim of 3PL logistics providers. Due to the constant evolution of pharmaceutical products, the product portfolio of manufacturers will change, and this will affect the efficiency of the providers. Get a sample copy of the pharmaceuticals logistics market in North America report free of cost. 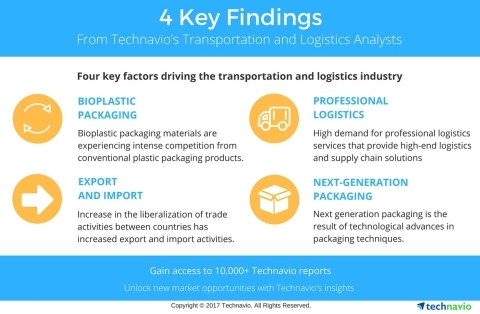 Access Technavio’s continuously growing logistics research library and find expert analysis on hundreds of markets. The pharmaceuticals logistics market in North America is expected to grow at a CAGR of close to 5% during 2018-2022, according to Technavio.